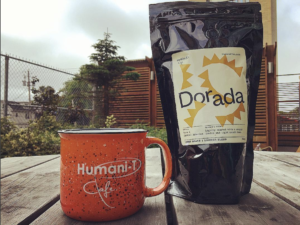 The Dorarda Coffee is an intriguing blend of Peruvian and Mexican and Guatemalan. Lightly roasted with a snappy finish and light mouth feel. Processing on all three coffees is washed, the cherries are pulped, washed and then dried before bagging. To develop Dorada, they take three of the most popular origins in the world which are blended green, and then roasted. Blending green allows the flavours to mature together in the drum which helps create a well balanced coffee. The Mexican and Guatemalan have mild fruit flavours and Peruvian has a more dark fruit and chocolate flavour. The lighter roast is a little acidic which has a light to medium body and is clean in the cup and on the palate.